In the class today we watched the movie “Before the flood” where you travel across the globe to witness the devastating effects of climate change. Something that surprised me the most was the melting glaciers. When you where in the forbidden terrain north of the Arctic Circle, where the active ice melts provide startling evidence of how quickly the climate is changing. And how shocking it was to hear that 30 feet of solid ice had melted in just the past 20 years. It also shocked me the flooding in Florida. When you visit Miami Beach, where the mayor talks about the current $400 million infrastructure project meant to keep the rising waters at bay. The most important take-away was the coral reefs. You and a Marine Biologist were talking about the severity of the dying coral reefs. These coastal systems have been plunged into turmoil due to the massive amounts of carbon emissions absorbed by the oceans. Created by climate change the oceans absorb most of our carbon emissions and the extra heat. The pressure we are putting on the systems the reefs may disappear. This is something me and my family could discuss. I think it is an astounding thing that you do. You spend two years traveling around and learn more and more about climate change, and what it is doing to our planet. 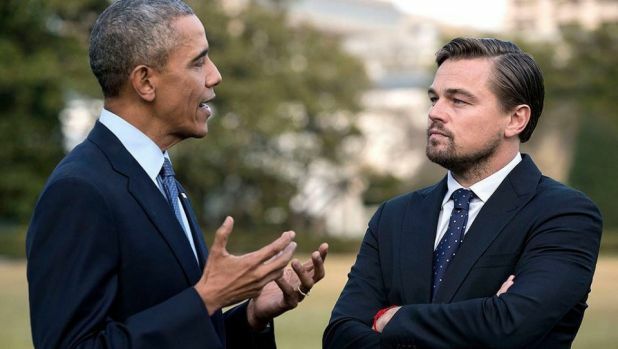 But something I wonder is when you visited the White House to talk with President Obama about the Paris Agreement, that is an agreement within the United Nation Framework Convention on Climate Change (UNFCCC). President Obama was hopeful for the future, affirming that the next 20 years we can use technologies to reduce carbon emissions with a gradual increase of more and more ambitious targets each year. He admits this will not completely reverse the warming that now is inevitable. though, he says that it can stop is before it becomes catastrophic. But then I wonder what is your opinion about this? You, who have seen so much about this for the past years. Please give me an answer as quickly as you can so I can get a Nasa mint next English class.